Some say it was the ancient Egyptians. Let's not worry about the details. 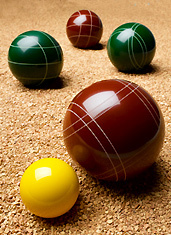 What matters is that a long, long time ago, the game of bocce came into existence. Introducing the city's first all-day, single-elimination Indoor Bocce Tournament at Ormsby's, debuting this Sunday and accepting entrants now. Basically, it's the bocce equivalent of Thunderdome. First, you'll need to recruit a teammate (choose wisely), then show up at Ormsby's and descend the stairs to the scene of your future stone-throwing glory. After weaving your way through the familiar den of adult carny games and unrefined basement chicanery, you'll find the courts waiting for you in the back. Between free-flowing beer and a grab bag of prepsters, hipsters and belles, it might look like another Saturday night fete at first glance... but stay focused. You're here to achieve nine-ball supremacy. The first team to seven points will move on to the next round (and maybe order one as well) against a new set of worthy opponents, then rinse and repeat until a winner emerges. And speaking of rounds, they will be delivered to you by the newly appointed Bocce Girls, outfitted appropriately for the occasion. We'll let you decide what that means.